XX109 first flew on 16th November 1972 and was the second production GR.1. She began her flying career with the A&AEE in May 1973 and was most famously used for the motorway takeoff and landing carried out on the M55. In 1986 she was flown into RAF Coltishall and retired to become a weapon loading trainer. With Saddam Hussein's invasion of Kuwait, the preparations for war included trials of suitable camouflage and XX109 was selected to trial the desert pink scheme. 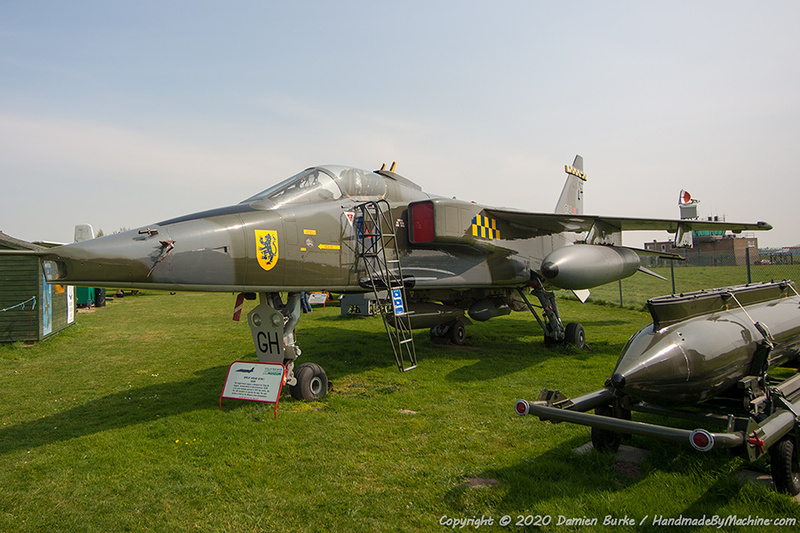 She retained this until 2003, when she was painted as a 54 Squadron machine as part of the Jaguar 30th Anniversary celebrations. She was acquired by the City of Norwich Aviation Museum in 2004 and moved there in September 2004. Since then she's been refurbished into a glossy version of the 54(F) scheme and is on external display.